Summer can be a really challenging time to stay motivated to make the healthiest choices, but with warm weather meaning less clothing, bathing suits, and special events and vacations to look and feel your best for, there’s no better time to stay active and eat right! Fitness with Rachel is here to help! 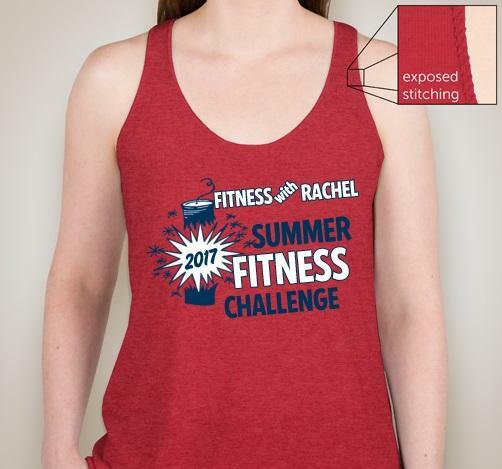 Last year’s Summer Fitness Challenge was so successful, we’re doing it again – and this year I’ve made it even better for so many reasons! 1st place winners will take home CASH! $20 of each entry fee will go directly to the winner. This could be a really significant amount of money! Even if only 10 people sign up for a session, that’s $200 to the winner! $100 to sign up for all 3 sessions – SAVE $20! Join with friends and be rewarded! Get 3 friends to sign up with you (or 1 friend to sign up for all 3 sessions) and I’ll give you a challenge shirt for FREE! 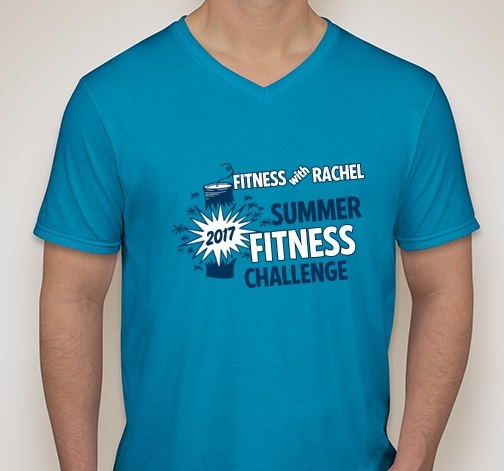 Like last year, we have an official limited edition challenge shirt! Anyone can buy this shirt, whether you sign up for a challenge or not. There’s both tank and v-neck styles, each comes in 6 different colors, both are just $25 each. Shirts come in 6 colors each, and a wide range of sizes. Click the links above to view them all! I’ll be keeping a Google Sheet and members will be given view only access to it so they’ll be able to see where they stand whenever they want. I’ll periodically print it out and post it in the studio, too. Food Logs can be done in a variety of ways. You can keep a paper record or you could use tracking software like MyFitnessPal or some other app of your choosing. Step Tracking can be done with either a fitness tracker or pedometer. If you already have one of those, that’s easy. Pedometers are available very inexpensively online and in drug stores, even. Class Attendance points will be updated by me, all you have to do is sign up and attend! Submitting Food Logs and Steps. Screen shots or photos of your fitness tracker readout, pedometers, and food tracking, submitted weekly on Sundays will be the preferred method. However, we can find alternate solutions, particularly if you’re doing pen and paper food logging. Just shoot me an email or talk to me before or after class. You’ll have the added benefit of some friendly competition, and help each other to stay motivated and encouraged. Get a FREE shirt for EVERY 3 friends (or single friends registered for all 3 sessions), so get all your friends together to do this! They don’t have to be current Fitness with Rachel “members” to participate and attendance in classes isn’t mandatory to participate. And remember, the winner gets $20 from each entry fee, so we want LOTS of people to sign up! We’re only ordering shirts this one time though, and orders are due by June 7, so get those friends signed up NOW! If you think you qualify for this deal, shoot me an email. Fine print: No funny stuff with this free shirt deal. If Sue and Peggy both decide to join up for the whole summer, Sue can’t claim Peggy if Peggy claims Sue, and any other weird combinations like that. I think you probably understand what I’m saying. If you’ve got questions that I haven’t answered, just leave a comment!